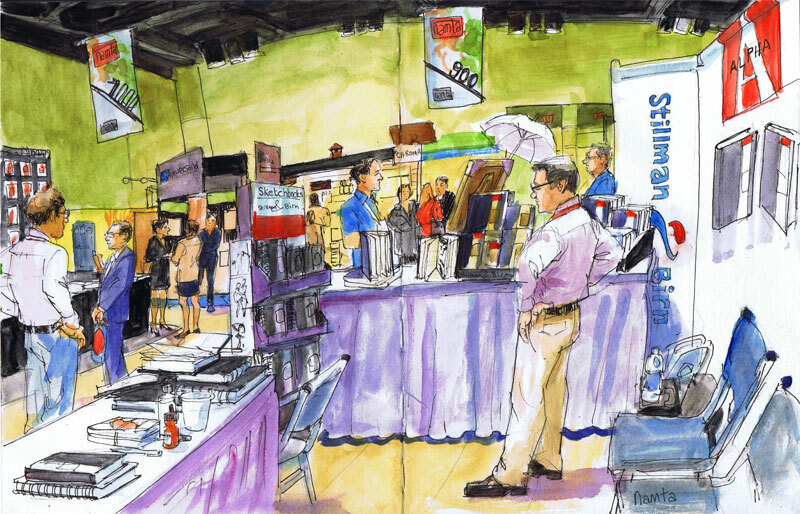 Namta, the Art Materials World International Conference and Trade Show was held right here in Orlando at the Convention Center. I was invited by Michael Kalman to use their line of premium sketchbooks and explain to prospective distributors how I liked using them. Stillman & Birn, based in New Jersey, produces premium quality sketchbooks. 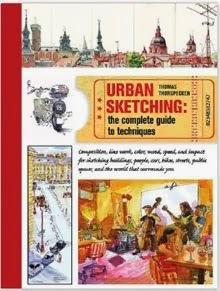 Their sturdy binding and wide range of paper weights make them ideal for urban sketching with dry and wet media. Michael is the nephew of Philip Birn (1911 – 2004), a highly admired Viennese bookbinder who brought his Old World craftsmanship to New York City in the 1950s. From his plant at 270 Lafayette Street, Birn pioneered the concept of the black hardbound sketchbook, which he marketed throughout North America, Europe and Australia. Michael and business partner Oscar Hernandez relaunched the Stillman & Birn brand in December of 2010. I've been having a blast test driving these sketchbooks. 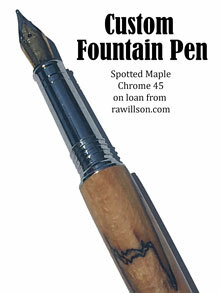 The paper is thick and rich and accepts watercolor washes on both sides of the pages. Michael explained that a sizing is applied inside the paper as it is made and also on the surface of the sheet. This lets the transparent watercolor washes glow like I've never seen before. The books come in five varieties, Alpha, Beta, Gama, Delta and Epsilon. 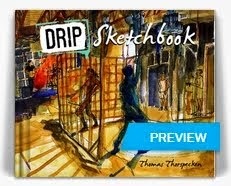 The sketchbook that I take everywhere with me now is the Alpha hardbound sketchbook. It measures 5 1/2 by 8 1/2 inches and I suspect it will always be in my bag from now on. The paper is 100 lbs or 150 GSM and it has a subtle texture that I like. 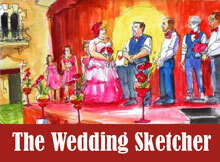 The sketch above was done in a new line of sketchbooks that was introduced at the trade show. It is a hardbound Delta series with 180 lb, 270 GSM paper. I've never seen a hardbound sketchbook with such a heavy weight, cold press paper. The book is 8 1/4 by 11 3/4 inches, which opens up as a huge spread. This thick paper doesn't buckle at all with heavy water color washes. 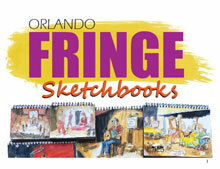 The sketchbook is a prototype and the actual sketchbooks will be in stores later this year. At this conference I got to sketch and talk about art with fellow artists and distributors, which made it a pretty sweet gig. 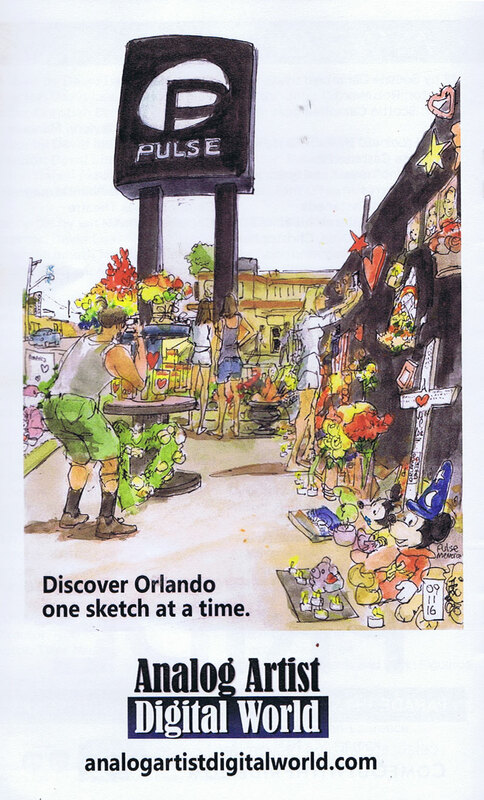 It felt good knowing that the sketchbooks that were stuffed full of my sketches, helped sell the product.